BALIK PULAU: The Health Ministry does not permit the ‘couching’ treatment, namely, pushing the eye lens into the cavity vitreous, conducted by certain quarters allegedly to treat cataract which was viralled on the social media, because it is very dangerous to patients. 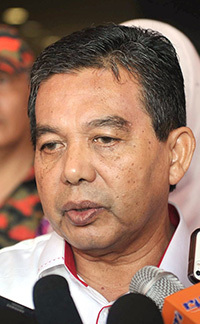 Deputy Health Minister Datuk Seri Dr Hilmi Yahaya said the treatment could cause numerous complications especially glaucoma. “I have never heard of this technique in my 40 years in medicine. We cannot allow that. Cannot be allowed, very dangerous,” he told reporters after flagging off a charity motorcycle convoy and aid to the poor here yesterday. An eye treatment service advertisement believed to be based in Kuala Kurau, Perak was viralled on the internet recently and it was scheduled to hold a three-day tour of Langkawi on Dec 23.